The Honda Fury is the 1300cc factory-modified cruiser that nobody remembers existing. I spent three hours in the seat of one yesterday, and here’s why I believe it deserves to be forgotten. The Fury is a factory chopper. Honda’s first foray into the world of a OEM-modified motorcycle. 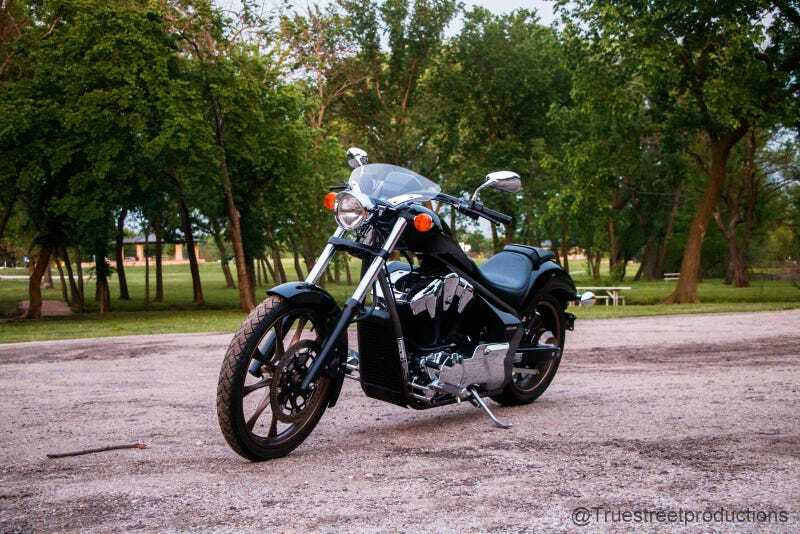 Built from 2009 to the present the VT1300CX features a water-cooled V-twin making a frankly pathetic 57hp and 79ft-lb of torque in a bike with a 681lb curb weight and a five speed transmission with a shaft drive. Fuel injection and water cooling are two bits of modernity added to the Fury with the radiator and hoses made as low profile and hidden as possible in order to retain a retro air-cooled aesthetic to complement the air-cooled power figures. This bike sounds cool. Aftermarket exhaust gives it the characteristic v-twin grumble and the torque off the line is enough to be reasonably interesting. The brakes, coming from a world of 20 year old poorly-maintained cruisers, are fantastic. The 3 gallon tank helps squash range anxiety though the 40mpg fuel economy is not stellar. Handling is far better than I would expect it to be for a cruiser. I wouldn’t keep up with that 1198 Superleggera on the twisties but the bike inspired confidence and I’m sure any reasonable amount of trying would result in pegs meeting the ground. The low seat height is fantastic for someone my size. Flat-footing this bike is a non-issue and despite its heft picking it up from the side-stand is easy. Overall the bike rides smooth and the engine at least tries to be smooth. It’s great around town but there is a bit of a tingle on the highway. The seat has very little padding combined with an EXTREMELY feet-and-hands-forward seating position results in using your nads as a cushion. A day later and my back is still killing me. Acceleration is extraordinarily poor and the rev-cut comes far too early. Once you get over the initial torque wave and right as it feels like things are going to pick up again in the higher (and by “higher” I mean it feels like 5000rpm. Some googling says the rev limit is 5250rpm) ranges. Cruising alongside someone on the highway, dropping two gears and giving maximum twist really should have more result. The transmission is generally somewhat sloppy and requires some finessing to avoid false-neutral situations. Clutchless shifting doesn’t really happen at all. This bike just rolled over 4000mi and already one of the fork seals is leaking. Good job? As hard as I tried it would not do dank whoolies. This thing is the riced Civic of the bike world. Style to appeal to a certain niche, lots of fun sounding noises, but not much substance and it’s kind of uncomfortable and you sort of wish you hadn’t. It isn’t super fun for around-town squirts and it isn’t comfortable enough for long distance (for my old man back, at least) which leaves it in the awkward niche of being the world’s coolest looking boring commuter scooter or for posing outside your favorite bar and getting heckled by all the Harley guys with Real Men’s Bike’s (tm).